Have a problem with an insect or disease on your trees? Take a look at our Common Tree Diseases & Pests page for information on several common tree diseases and insect problems. If what you have is not listed, the Master Gardeners at the MSU Extension office may be able to help you. They have a diagnostic lab to analyze and identify plant problems and make control or management recommendations. Contact the Master Gardeners at (734) 997-1819. Crop tree management is a very effective way to manage your trees. Learn more about Crop Trees and Thinning. For information on national forests, visit the USDA Forest Service web site. Information and links on the planting and care of fruit trees. Learn more about cutting grapevines and poison ivy vines, which can cause serious damage to standing trees. Learn how trees also play an important role in the pollination process. FireScience.org began in 2012 to provide quality data and information for students pursuing a career in fire science. We provide tools and resources to help students and professionals make well-informed decisions about their education and career training. Check out our Tree & Shrub Planting Guide, which includes a plant spacing chart; information on site preparation; planting; and maintenance recommendations. Also review our handy reference, Likelihood of Deer Damage on Trees and Shrubs, which provides general guidance in selecting plants based on their deer damage potential. Learn about pruning forest trees, an excellent way to improve the value of a standing tree for a future harvest. 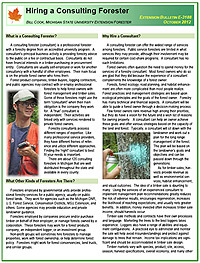 For information on starting or being certified as a Tree Farm, visit the American Tree Farm System web site. For helpful information, see Planting and Transplanting Trees and Shrubs from the University of Minnesota Extension Service.